‘Figaro is by far the best work ever devised for the stage; it combines everything that moves the human heart and mind: forlorn hope, pleasantry, satire, profound significance, also much ado about bagatelles and vain amours.’ Thus is Jürgen Flimm quoted – oddly, in English, but not in the German version – on the website of the Berlin State Opera. Leaving aside the silly if pardonably hyperbole – how on earth does one say it is ‘by far’ better than Così fan tutte or Don Giovanni, let alone Hamlet, Tristan, or Agamemnon? – the only printable response I can summon to that would be: ‘you have a funny way of showing it.’ Flimm’s Bayreuth Ring was noteworthy for – well, nothing at all, save for irritating displays of dramatic hyperactivity. His Fidelio for Covent Garden likewise seemed to be about nothing at all: imagine that, for Fidelio, or indeed for the Ring! This, however, is significantly worse. All the ludicrous hyperactivity is there, in order to present a Marriage of Figaro that reduced Mozart and Da Ponte to the level of a silly, vulgar farce: a farce, moreover, that does not work even on its own terms. It used to be the case, not so long ago, that, even if they fell some way short of revelatory, productions of this opera would at least cohere dramatically; now that hope seems at least as forlorn as it would be, perhaps more so than, in a production of Don Giovanni. David McVicar’s Covent Garden ‘prettiness’ looks almost distinguished by comparison; here we languish at the level of Michael Grandage (Glyndebourne) and perhaps even the dread Jean-Louis Martinoty (Vienna). ‘Updating’ is generally an unhelpful time. In many ways, the least interesting thing – although the thing dull people will often become most exercised about – is when and where something is (re-)set. As Schoenberg remarked in a different context: ‘A Chinese poet speaks Chinese, but what is it that he says?’ ‘Updating’ is, perhaps, the mot juste here, however, for as with McVicar, Grandage, and quite a few others, it seems done for the sake of it. The intricacies of Da Ponte’s libretto pose some difficulties for such a change of scenario; yet, by the same token, the droit de seigneur was at best highly exaggerated, at least in theory, for the eighteenth century, even in Andalusia, let alone Beaumarchais’s France. A pre-revolutionary situation elsewhere can work very well, as in Janet Suzman’s Cuban setting for the Royal Academy’s superlative 2015 performances; Martin Lloyd-Evans at the Guildhall (yes, another conservatory, which is where London audiences will find much of their best opera) took more of a risk, which mostly paid off, in looking to the world of modern American politics and its sexual harassment. (I wonder how prescient that would seem now, in the Age of Trump.) Flimm, however, simply moves everything to the 1920s, presenting the characters as holiday-makers (as does Grandage), and then proceeds not to deconstruct the characters and the action, but seriously to misunderstand them and to have them drown in a sludge of silliness. 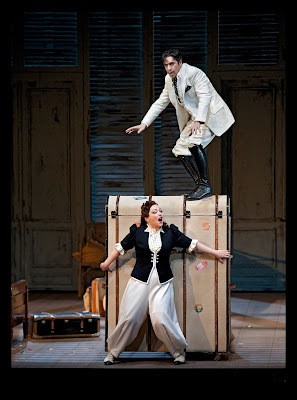 Pointlessness – can you think of a worse reproach for a staging of Figaro than that? – reigns supreme, and certainly not in a Beckettian way. Even the incessant use of a strip in front of the pit for stage action seems to serve no purpose whatsoever. Mindless seekers after novelty would doubtless praise it as imaginative; perhaps they would also hail breaking the fourth wall as a pioneering development. And yes, we do have that at some points too, not least in some irritating business at the beginning of the third act, when poor Count Almaviva must do both, wandering around behind and in front of the pit, waiting for the continuo player to begin and eventually having to prod him into action. The guffawing was of almost post-interval Glyndebourne proportions. Nowhere indeed is this staging more catastrophically flawed than in its treatment of the Count. I can see that it would be interesting to deconstruct his masculinity. Here, however, he is portrayed – with awe-inspiring professionalism by Ildebrando d’Arcangelo – as a gibbering idiot, who cannot even hold a rifle. He is more a sitcom cross between Frank Spencer of Some Mothers do ’ave ’em and Manuel from Fawlty Towers – would that the dramaturgy had a fraction of that series’ skill and wit – than anything words, music, or just a little thought might suggest. And nothing is done with that bizarre ‘reinterpretation’: the audience simply laughs at him dropping things and injuring himself. He is a coward with trembling hands: yes, we get it. Is that all you have to say about him? 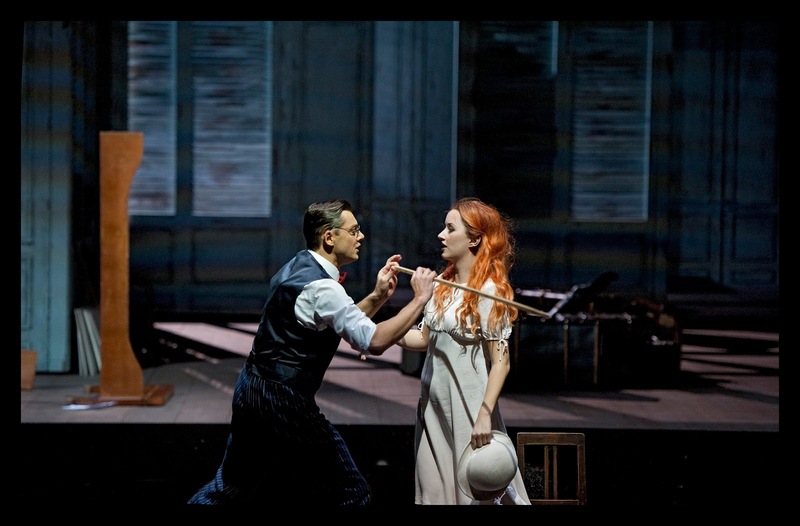 In what approaches a parody of reactionaries’ charges against ‘updating’ and ‘modern opera productions’, Barbarina appears all over the place for no apparent reason. In what struck me as a deeply, or shallowly, misogynistic portrayal, she again provokes hysterical mirth from some patrons as she is forced to play the part – presumably because she is not of noble birth – of a ‘common tart’. Quite why Antonio, who also appears far too often, is wearing a black tail coat, when everyone else is in ‘summer wear’ is unclear. Nor is there any evident justification for him and his daughter running around ‘hilariously’ with wheelbarrows full of plants, which they proceed to tip over the stage, whilst the second act proceeds. Having earlier simply walked out of a door and then pushed it across the stage, as opposed to jumping out of a window, Cherubino is nonsensically discovered at the end of that act, ‘bonking’ – as would seem to be the appropriate post-seaside postcard language for the production – yes, you have guessed it, Barbarina, in the wardrobe (whose function is repeatedly confused with a trunk of luggage). The intricate business of the second act is not only coarsened but rendered incoherent, almost to the level of Martinoty in Vienna. At the end, there is not even a hint of revolution, or revolt, of Figaro as sans-culotte (unless that were, highly obliquely, to be from bizarre penchant for rolling up his trousers throughout the evening, even during his betrothal ceremony). There is no sense that anything has actually taken place. They all just collect their luggage and head home. If that is your idea of this folle journée, then either you or I have completely misunderstood. There seems little point in going on further about what one sees; it is not worth the effort. Matters were not helped by Pablo Heras-Casado’s conducting. It improved as the night went on, yet remained markedly at odds with the rich, noble Klang of the Staatskapelle Berlin, let alone the rich, noble score of Mozart. The Overture was perhaps more harried than I have heard it, and much of the first act suffered from strange, seemingly arbitrary tempo decisions, then pursued quite without flexibility. Too often, the score could not breathe; there was, I suppose, at least a parallel with much of what was, alas, going on onstage.